When is a kayak not just another kayak…when it is a handmade, 100% red cedar water craft designed with optimal enjoyment, stunning looks and classic construction in mind. Taking over 500 hours to create, this is so much more than what you might find at a big box retailer. 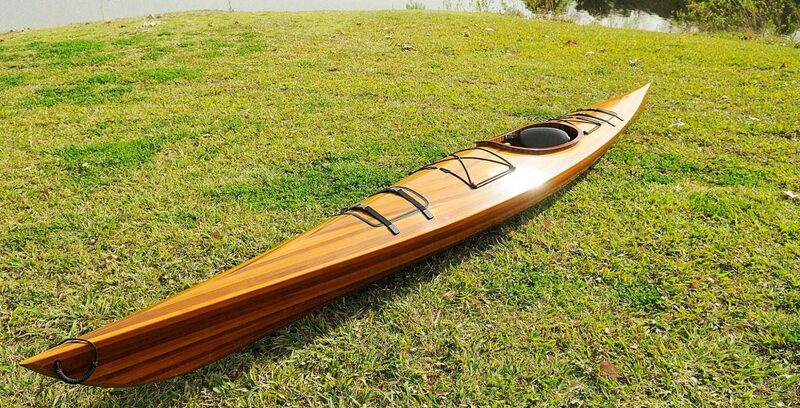 Imagine yourself cascading along the water in this light weight, easy-to-carry and elegantly crafted kayak. The beauty of the natural world around you comes fully into view as you slice through the current. It’s not about just being on the water, it’s about deftly cutting through it, it’s about a smooth one-of-a-kind experience, and it’s about knowing that your water craft is a handmade emblem of true craftsmanship. Over 500 hours of build time means that you not only get nautical precision, but the stunning beauty that comes from hand joined cedar strips–the best quality available. Extra care is taken with the finish as the kayak’s exterior combines a fiberglass epoxy resin with a marine varnish ensuring the boat’s longevity and durability. Cut through the water quickly, smoothly and in classic kayak style with this incredibly beautiful watercraft. As much work of art as it is boat, this kayak will be in your family for years and years as you and yours experience hours of enjoyment. Our process is thorough. Over 500 hours of craftsmanship went into the creation of this handmade vessel. It certainly shows! Coated in a strong fiberglass/ epoxy finish it is truly built to withstand whatever may come its way. What could make our truly unique handcrafted wooden boats even better – hand painted stripes that add a pop of color and a classy elegance to the vessel. This 15’ kayak with custom stripes is truly a piece to behold. Not to mention, the way that it gracefully glides through the water will make you never want to leave the peace and tranquility of the river, lake or stream. Generations of boat builders certainly knew what they were doing, and we pride ourselves on adopting those same old world values in every single product we sell. A tandem boating experience that you will not soon be forgetting. We have spent hundreds of hours on this finely crafted 2 person kayak so that you really do get the ultimate enjoyment. Hand joined red cedar strips coated with a durable fiberglass epoxy resin create a finish that is as stylish and amazing to look at as the kayak is to navigate. Traveling back in time, does not describe the experience of history you get from this watercraft. With all of our boats, tradition and classic lines emphasize how incredibly well-made the vessel is. This one-of-a-kind showstopper is the canoe you’ve always dreamed about owning. Handcrafted, blending hours upon hours of workmanship with attention to detail, this boat is perfect on any type of water for any intended purpose. The low back deck makes this an extremely comfortable ride, while the leg room is ample and comfortable. We pride ourselves on the uniqueness of each and every one of our watercrafts, and yet the Hudson is one in which we are particularly proud. For the canoe racing fan, we bring you this one-of-a-kind showpiece that will win you the race and get you noticed. Designed to be fast, graceful and look beautiful, this boat took over 500 hours to construct. Hand joined cedar planks coated with fiberglass resin ensure that it is both durable and incredibly strong. The design is intuitive as it tracks fast with barely any wind resistance. The cockpit sits low enough to provide optimal stability while still being large enough to comfortably accommodate a racer’s legs. Enjoying the tranquility of the water, marveling at the wonder of the wildlife around you, you glide smoothly and seamlessly in your tandem kayak. A moment which will certainly live on in your memory, the kayak with its sleek wood finish and still light weight design, represents the absolute best in custom made watercrafts. With hundreds of hours dedicated to its creation, this tandem kayak is a true showpiece. Featuring a specialized fiberglass epoxy coating encapsulating hand joined cedar strips, it is guaranteed to bring you years and years of fun and excitement. Check your inbox for our regular Emails.